When two bands – lauded as musical spearheads in their respective careers – join forces for the evening, you can’t help surmising how special this evening’s show will seem, even more so as it’s one of just two shows across the UK where they share the bill. The parallels between Saint Etienne and Scritti Politti, on reflection, make them ideal bedfellows: a catalogue of collaborations crossing diverse musical genres, a creative renaissance on the cusp of the New Millennium, and comebacks to the independent labels they first cut their teeth at. The venue is brimmed to full capacity as Green Gartside and the current Scritti Politti line-up take to the stage amongst enthusiastic applause. “I’m a bit shell-shocked”, he acknowledges as he leads into ‘The Sweetest Girl’. Henceforth, Gartside deliver an assured performance which effortlessly draws from the sonic diversity of their 35-year back catalogue. Elements of hip-hop (‘Die Alone’), dub-reggae (a cover of Jeru the Damaja’s ‘Come Clean’ as a tail-end to ‘Jacques Derrida’”) and rock (‘Umm’) are intertwined with the warmly-appreciated Top 40 singles ‘Wood Beez’ and ‘Absolute’ with smooth versatility. What’s most impressive about Scritti Politti’s set is that Gartside’s distinctive voice is still there, remaining as atmospheric as it was during their first stint at Rough Trade. He may joke with the audience about the “sh*t” standard of funk music released on the label at the time (i.e. the bridge of ‘Jacques Derrida’), but hearing a stand-out voice of that musical generation, that has stayed constant in the ravages of time, adds a timeless quality to the first half of the evening’s set. Following the interval, the chant of “Hello Fibbers!” by Sarah Cracknell – bedecked in feather boa and sequinned top – heralds Saint Etienne’s arrival on stage. Her entire presence, vocal and visual, remains alluring and arresting, yet is offset by unassuming acceptance of the audience’s awesome appreciation. And, like Scritti Politti, the band’s canon is plundered with aplomb, much to the pleasure of the crowd. Tracks from seven albums feature among the seventeen performances; spanning début single ‘Only Love Can Break Your Heart’ to five contemporary pieces of ‘Words and Music’. The electronics provided by Pete Wiggs and Bob Stanley are universally rich in tandem with Cracknell. 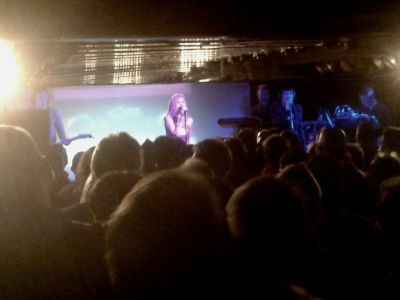 Accompanying the sounds on stage are projections which marry the stories contained in each song; representations of the 60s cinema which have remained a constant inspiration to the Saint Etienne oeuvre dominate, while ‘Popular’ is treated to a montage of images taken from 70s chart rundown sequences which kicked off episodes of Top Of The Pops at the time. Inevitable concessions to the upcoming festive season is contained in the encore: yes, there’s a Tim Burgess-less ‘I Was Born on Christmas Day’, complete with more 1970s Top Of The Pops scenes of a Yuletide nature; but there’s an extra gift from the Saints to be enjoyed: an acoustic cover of Chris Rea’s ‘Driving Home for Christmas’ raises spirits in the room. Combining two acclaimed bands of previous decades on one bill has the potential to disappoint; the sounds executed to past vinyl may not translate well to present performance. Saint Etienne and Scritti Politti have the ability to shatter this preconception, disparately and as part of the evening’s package. We hope their other joint date in Brighton which follows their night in York is equally smashing. my darling favourite band from my teens and all the way through to the mid 30's did not disappoint and even drew some tears from sheer joy and unadulterated solace. love love love.